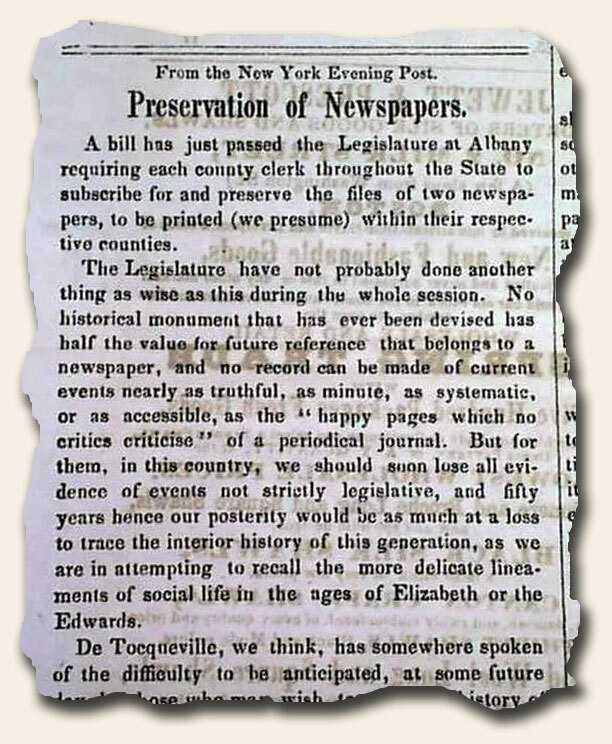 Over 160 years ago the New York legislature had the foresight to be concerned about the future holdings of newspapers, and more importantly the loss of the unique perspective of history which can only be obtained through newspapers of the day. Their cause remains as relevant today as it was in 1849. 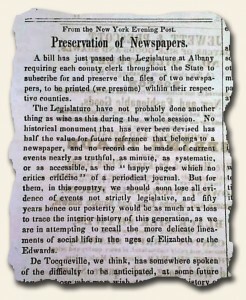 The photos show the entire editorial as found in the “Vermont Chronicle” of Windsor, May 2, 1849, but portions include: “…No historical monument that has ever been devised has half the value for future reference that belongs to a newspaper, & no record can be made of current events nearly as truthful, as minute, as systematic, or as accessible, as the ‘happy pages which no critics criticise’ of a periodical journal…” and “…De Tocqueville…has somewhere spoken of the difficulty to be anticipated at some future day of those who may wish to trace the history of our people for the want of durable monuments or records of their current life & achievements…that the newspaper was almost our only historical repository & that was usually destroyed as soon as its contents were glanced at…” and much more. A fascinating article on the need to preserve newspapers; something which all of us in this hobby continue to do in some small way. Thanks for the essay. You’re right. It’s beautifully written and profound in its insights. The editorialist certainly knows his Roman literature. He bestows a kind of sacredness on everyday activities which are better appreciated in retrospect (by the future) than those enacting their daily lives. I tend to appreciate the special rather than the trivial, but he’s saying the sum total of the trivial may indeed add up to the special. We may be the last generation who can truly savor reading a book or newspaper. It involves a different mentality–a deliberation–a discrimination–than surfing the net. It is what will always make your business, and the service you provide to civilization, special. Take care.